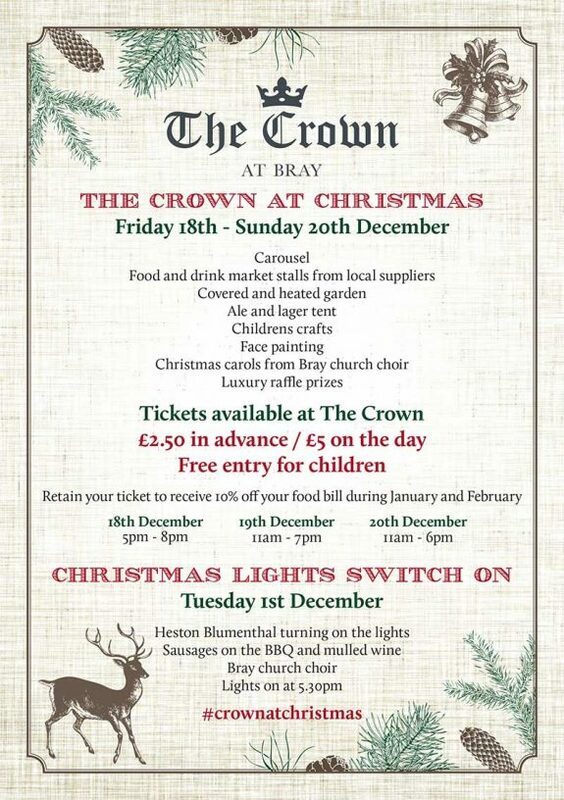 At Christmas time, The Crown has a proud tradition of putting on the finest festivities in Bray. The staff don their Santa hats, the heated marquee will go up in the garden, and the Christmas feeling is coming to town for our “Crown at Christmas” celebration. This year we’re going bigger than ever – for the kids we have a craft area and face painting, plus a wonderful carousel, and for the grown-ups we have an ale and lager tent. We also have food and drink stalls from our local suppliers – making this a Christmas treat that shouldn’t be missed. And should Jack Frost decide to come out, don’t worry, we’ve got you covered in a heated marquee that would warm even the Grinch’s cold heart. We’re also delighted that the local Bray Church Choir will be attending to sing everyone’s favourite Christmas carols. Running from Friday 18th December until the 20th December, tickets £2.50 for adults if you get advanced booking at The Crown. On the day it’s £5 for adults, so best to get down to the pub before to book! The best news of all, Children’s entry is free. Also don’t forget that your ticket will get you 10% off your food bill when dining at The Crown during January and February 2016! So head on down to the Crown this Christmas, be part of our popular festive celebration and spread goodwill and joy (and fine food) to your fellow man. We are absolutely delighted to announce that this year’s Christmas lights will be switched on by none other than Heston Blumenthal. Each year The Crown embraces the full Christmas tradition with bright lights, a 25ft tall tree, and Santa’s Grotto for the good children to make a wish for this year’s gifts. This year is no different, and we intend to celebrate in style with the Michelin-star-winning mastermind chef holding the light switch. 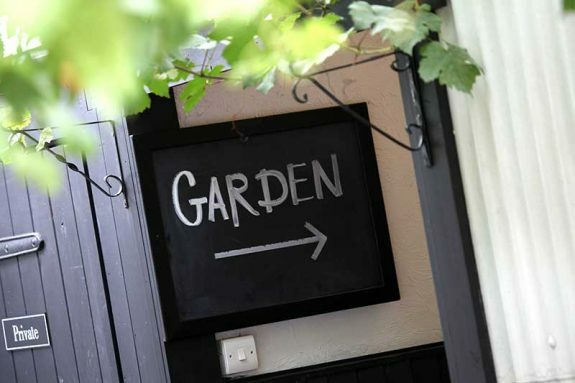 Taking place in our garden on the 1st December, the switch on will bring in revelers from all around, huddling around our fireplace and eagerly awaiting the sausages from our BBQ and mulled wine. We’re also in for another treat as the local Bray Church Choir will be coming down to make the Christmas mood complete. This really is an unforgettable night in The Crown’s calendar, and a staff favourite as we welcome the festive feeling. We advise guests to arrive from 5pm ready for the switch on at 5:30pm! We hope to see you there! And don’t forget, on the 21st and 22nd December, Santa will be making a special visit to the Hinds Head Grotto for all the children to say hello and receive some gifts! You can also follow #crownatchristmas on Twitter for updates! You can also get more information about upcoming events in our flyer.